With back-to-school plans in full swing, I’ve been seeing a lot of ‘growth mindset for kids’ pins on Pinterest lately, and since my goal for the 2018/2019 school year is to find ways to push my daughter outside her comfort zone in an effort to prove to her that she can do anything she puts her mind to, I became intrigued. I’d never heard the term ‘growth mindset’ in my life, but the more I poked around online, the more interested I became. My daughter is the first to give up in the face of things she perceives to be difficult, and while I do my best to help her break complex tasks down and work through her feelings of frustration, I hadn’t realized how much I (unknowingly) limit her growth. I’ve started to make some pretty significant changes in our household over the last several weeks, and while they haven’t always been comfortable, I’m happy to say we’ve seen some pretty impressive improvements, and I finally feel as though I’m EMPOWERING my child to reach her dreams, rather than chasing after them for her. 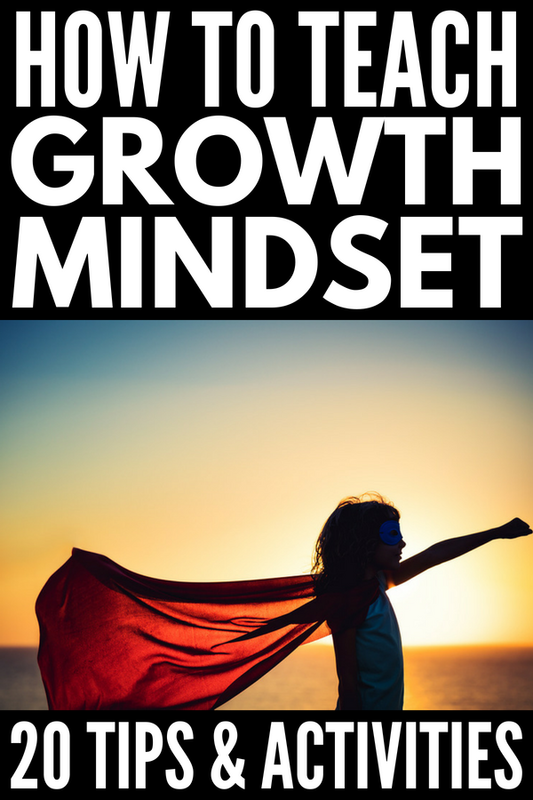 Here are my best tips for developing a growth mindset for kids, as well as my favorite growth mindset activities for kids! What Does ‘Growth Mindset’ Mean? A child with a fixed mindset believes her level of intelligence is fixed at birth. She perceives failure as confirmation that she lacks the skills and abilities needed to be successful at certain tasks, and doesn’t believe that practice will help improve these skills over time. A child with a growth mindset thinks very differently. Instead of shying away from failure, she sees it as an opportunity for growth. She believes that practice can (and will) improve her intelligence, and is passionate about learning and taking risks. If you’re looking for strategies for developing a growth mindset for kids at home or in the classroom, here are some tips and ideas to help you get started. Be a positive role model. It’s no secret that our children watch our every move, so if you want to foster a growth mindset in your child, it only makes sense that you need to model that behavior yourself. Of course, this goes above taking risks and setting personal goals. It means sharing your fears and failures with your child, showing her how you use constructive criticism to better yourself, and replacing negative self-talk with positive self-talk. Remember to be the change you want to see in your child, even if it pushes you outside your comfort zone. Help your child set SMART goals. Get in the habit of creating goals with your child. Make sure they’re SMART (Specific, Measurable, Attainable, Relevant, and Timely) and that they push your child beyond her comfort level (but not so much that they feel impossible), and set regular reminders in your calendar to go back and evaluate her progress over time. Change the way you offer praise. Stop praising your child based on results (‘I’m so proud of you for getting a B on your math test!’), and instead offer encouragement for her efforts and actions (‘You studied really hard for your math test and it really paid off. You must feel so proud of yourself!’). This slight shift in language teaches your child that her achievements are directly tied to the amount of effort she puts forth, which naturally encourages a growth mindset. Push your child outside her comfort zone. Provide your child opportunities to do things beyond what she feels she’s capable of, and help her find ways to achieve these goals. This may mean helping her with planning and organizing her time, teaching her how to break tasks down into smaller, more manageable action items, or enforcing additional study time. The point is to (gently) push her beyond what she feels she is capable of, and then help her meet (or exceed) what she set out to do so she feels more confident in her abilities. Teach your child to view failures as an opportunity for growth. While it’s easy to get caught up in the negative emotions associated with failure, teaching your child how to turn her disappointment into inspiration and motivation can be extremely empowering. Instead of dwelling on what went wrong, focus on what went right, and help your child strategize what she can do differently next time. Encourage positive self-talk. Oy. This is a hard one, isn’t it? We live in a day and age where social media skews our perception of reality, and we’re taught from a young age that we’re not good enough. This makes our job as parents and educators much more difficult, but when we teach our kids to recognize when they are engaging in negative self-talk, and teach them how to turn this thinking around by equipping them with more positive modes of thinking, we will (eventually) break the cycle. Developing a growth mindset for kids isn’t JUST about pushing your child outside her comfort zone and changing the way you praise her for a job well done. There are HEAPS of fun – and meaningful – growth mindset activities for kids you can engage your little ones in to encourage positive self-talk, teach perseverance, and turn failure into opportunity, and we’re sharing 9 of our favorites below! I have been a fan of the Teachers Pay Teachers website for years as it includes all kinds of fabulous resources for parents and educators at a low price, and this growth mindset for kids bundle is no exception. Whether you’re just getting started with developing a growth mindset in your child at home, or need classroom activities to kick off the school year with a bang, this set includes cut and paste worksheets, coloring pages, a sorting game, cut and paste sentence sheets, and more. If you’re looking for back-to-school ice breakers as well as solid growth mindset activities for your classroom, this collection of ideas and activities will inspire you! I love how Jenna dives right in with a group activity that not only forces her students to work as a team to achieve something difficult, but that she finds a way to demonstrate the power of positive versus negative thinking. Oh wow, this one isn’t easy, but it’s one of another set of GREAT growth mindset activities for kids in middle school and beyond. All you need is a set of plastic cups, some string, and elastic bands for this team building / growth mindset for kids activity! This is another fabulous bundle for teachers, and I love the idea of organizing growth mindset activities for the entire class to participate in each week. It’s a great way to start or end the week on a positive note, and engaging students in group activities helps ensure greater success, which is key to building a growth mindset over time. Hemispheres of the Brain Growth Mindset Activity | Beg, Borrow, and Teach! If you struggle to find ways to get your child/students interested in working beyond their comfort level, this learning style quiz and growth mindset ‘hemispheres of the brain’ activity may be just what you need. It’s a fun way to help your students figure out if they are right- or left-brain thinkers, allowing them to focus on activities designed to balance their learning style. If you’re looking for growth mindset activities for kids that help demonstrate how to turn mistakes or failures into opportunities, you’ll love this idea. It’s a great start- and/or end-of-year activity for students, but don’t be afraid to use it at home when your child is struggling! This is a set of 25 coloring pages, and each contains a positive growth mindset for kids quote, making it the perfect activity for kids to enjoy at home or in the classroom. Coloring is a great calming activity for kids of all ages, and the use of positive affirmations makes this one of many great growth mindset activity for children who struggle to believe in themselves. This bundle has 5 logic puzzles designed to develop higher order thinking skills for kids in middle school. They make a great group activity to develop growth mindset for kids in the classroom, and can be used as an independent after school activity for kids who need help with their critical thinking skills. With 275 journal prompts for kids in middle and high school, as well as an editable template organized by month you can print and bind, this is a dream come true for teachers looking for growth mindset activities for older kids. Your Fantastic Elastic Brain: Stretch It, Shape It. If you’re struggling to find a way to teach growth mindset for kids, this award-winning book will help you explain how the brain works, the importance of making mistakes, and how stretching our brains makes us stronger. Not Yet. Written for kids aged 4-8, this book is a FANTASTIC introduction to the Power of Yet. I highly recommend it to all parents and teachers! The Girl Who Never Made Mistakes. Another book for kids in preschool to grade 3, this is a great tool to teach kids that it’s 100% okay to make mistakes. Big Life Journal: A Growth Mindset Journal for Children. This guided journal is packed with growth mindset activities for kids, and will give you an opportunity to connect with your child in a meaningful way as you push him/her to embrace challenge and live a life of gratitude. Carol Dweck once said, ‘If parents want to give their children a gift, the best thing they can do is to teach their children to love challenges, be intrigued by mistakes, enjoy effort, and keep on learning. That way, their children don’t have to be slaves of praise. They will have a lifelong way to build and repair their own confidence.’ I love this quote because it reminds me that my job as a parent isn’t to make things easy for my daughter, but to push and challenge her such that she’s not afraid to take risks, learns from her mistakes, and aims to please herself instead of worrying what other people think of her. I hope this collection of parenting tips and activities to develop growth mindset for kids inspires you as much as it’s inspired me! If you liked this collection of parenting tips and activities to develop growth mindset for kids, please share this post on Pinterest! And if you’re looking for more parenting tips and tricks, please follow our Parenting boards where we find all kinds of fabulous ideas we find each day!